The purpose of the Superkarts! USA Licensing Program is to provide a standardized ladder of driver development within the organization. The following document details each license level, its requirements and the classes that are eligible to the holder of each respective license. 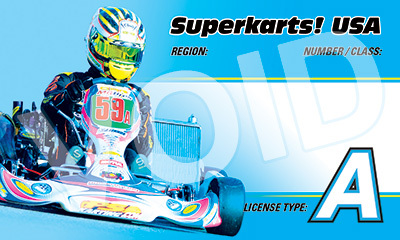 The A License is reserved for SKUSA’s most accomplished drivers. This license is required for any driver wishing to compete in the S1 category. Competitors will be required to com- plete an application form that will include an area where the driver will present results, perfor- mance highlights and a career overview, which the SKUSA staff will use to determine license eligibility. Only drivers with an A license are permitted in S1. KZ drivers require an A or B license. 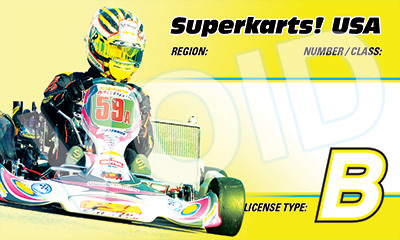 The B License is the primary license for all experienced adult drivers in Superkarts! USA. To be eligible for a B license, one must have at least two years of prior experience in the sport. Competitors new to SKUSA must complete an application form detailing past experience to be considered for a B license instead of a C license. The C license is presented to anyone new to karting within the Superkarts! USA community. For drivers who are new to shifterkart competition, this license will make them eligible for the S3 (Novice Stock Moto) category. Should they wish to advance to the S2 (Semi-pro Stock Moto) or S4 (Master Stock Moto) classes, they will need to show proficiency on the racetrack and then apply for an upgrade to a B license. All Junior drivers will receive a D License when joining SKUSA. Any Junior driver wishing to graduate into a Senior class (Stock Moto or X30 Senior) will automatically qualify for a C License, which will make them eligible for S3 (Novice Stock Moto) or X30 Senior. Should a driver wish to graduate into S2, they will need to apply for a B License. You can renew and apply for new membership at the link below. Starting with the 2018 racing season, SKUSA Memberships are now only valid from January 1st through December 31st. $100 - The standard renewal period for members will be November 1, 2018 through January 15, 2019. $125 - The late renewal period will be January 16, 2019, through January 31, 2019. SuperKarts! USA Does not sell or offer partial or pro-rated memberships. 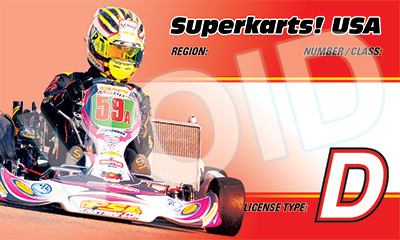 The SuperNationals are part of the National SKUSA Pro Tour, but also operates as a stand-alone race event. A one-event membership will again be offered at time of Supernats Registration and can be purchased in lieu of an Annual SKUSA membership. Race numbers are no longer chosen or reserved as part of the membership process. The Race Numbers and Panels page explains this in detail.